Deals, news and events for the investment community across Upstate New York. 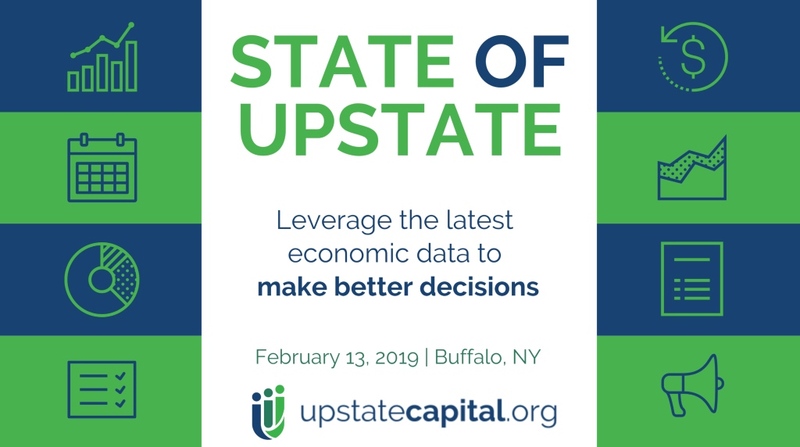 NEXT WEEK: Join Upstate Capital for the 2019 State of Upstate as we bring together investors, business leaders and entrepreneurs from across the region to discuss the economic outlook for Upstate New York and beyond. Equip yourself with the latest data to make the better business decisions in the coming year. Upstate Capital members are invited to try out curling through on-ice gameplay at The Buffalo Curling Club. Learn more and register today! Have a deal you'd like to share? Submit it here! The 2019 Executive Budget for New York State includes NYSERDA’s $1.5 billion in competitive awards to support 20 large-scale solar, wind and energy storage projects across upstate New York. In addition, New York will invest up to $200 million in port infrastructure to match private sector investment in regional development of offshore wind. Upstate Venture Connect’s 2018-19 CEO survey is live. The initiative drives to discover the impact and needs of Upstate New York’s high-growth companies. Aggregated findings are published in a report that is shared with corporate/academic leaders and policymakers across NYS. The New York Business Plan Competition has begun accepting applications for student entrepreneurs to compete in the regionals stage of the NYBPC. Deadlines vary by region, and winners will compete at the statewide business plan competition in Albany on April 26. February 13 - Buffalo - 2019 State of Upstate - Join Upstate Capital for the 2019 State of Upstate as we bring together investors, business leaders and entrepreneurs from across the region to discuss the economic outlook for Upstate New York and beyond. Equip yourself with the latest data to make the best business decisions you can in the coming year. Register today. March 19 - Ithaca - Women, Money and Tech - Gain insights on why leadership teams with women outperform all-male teams, learn strategies for improving your business performance, and develop relationships with people and organizations focused on advancing gender equity in venture capital and entrepreneurship.. Register today! February 19 - Buffalo - Startup Legal 101: Advice from Buffalo's Top Startup Lawyers. The Founder Institute offers an opportunity to learn the key things that you need to know to start your company from a top local attorney. March 6 - 7 - NYC - Air Force Pitch Day - the inaugural event that puts $40 million on the table as step one in a new initiative that will transform how the Air Force works with startups and universities and research centers. It’s a new bureaucracy-busting contract: a convenient one-page, one-day, credit-card-based transaction. March 15 - Ithaca - Biotech I-Corps Short Course - Cornell University will host the Biotech I-Corps Short Course from Friday, March 15 to Friday, March 29. The free course will feature entrepreneurship training for researchers and scientists and provide coaching from industry experts. © Copyright 2018 Upstate Capital Association of New York. All rights reserved.